By Appointment is best. You might get lucky just popping by, but a great deal of the month I am out visiting artists or scouring up new items, so days in the gallery are limited. Please refer to our stock # 1272 when inquiring. 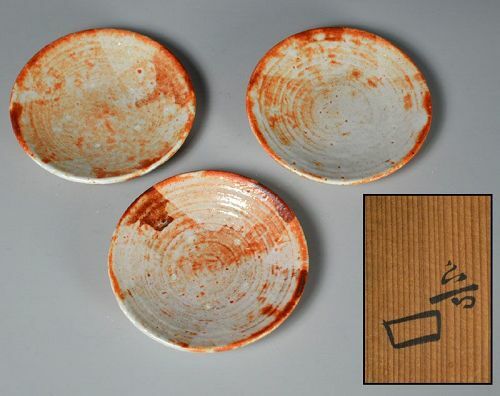 An original boxed set of three dishes by 20th century legend Kitaoji Rosanjin enclosed in the original signed wooden box titled Shino Hira-Mukozuke 3. Each has been brushed with two wide swatches forming a cross in iron under the thick red tinged shino glaze. They are 13 cm (5-1/2 inches9 diameter each, and in excellent condition. Kitaoji Rosanjin (1883-1959) They say adversity is the mother of invention, and Rosanjin can be said to epitomize that expression. Born during the tumultuous first half of the Meiji period in the cultural center of Kyoto, he was adopted at age six by a woodblock carver. He showed an early genius for calligraphy, and began his early manhood as a carver of seals and carver/painter of shop signs after a brief apprenticeship to a pharmacy. He also taught calligraphy and bought and sold antiques during these early years. In 1921 he founded what would become the impetus for his life’s work, his first restaurant, the Bishoku club, and followed in 1925 with a restaurant in Tokyo called the Hoshigaoka. Rosanjin began working in ceramics to replace the collection of dishes that was destroyed in the 1923 Kanto Earthquake. He was largely a self taught artist with a diverse range, beginning with a kiln on his rented property .in Kamakura, and later paying visits for brief apprenticeships to many of the days top artists. He retired to work exclusively on the arts in 1936. Magazine editor, lacquer artist, metal-working and finally store owner in Tokyo’s Ginza, Rosanjin was everywhere at once. He was displayed at the museum of Modern Art in New York in 1954, a rare honor indeed for living artist. Like his contemporary, Kawai Kanjiro, Rosanjin was offered the title of Living National Treasure in 1955 for his work in Oribe pottery, but refused the offer.